Yogyakarta – Monday, August 20, 2018, the Doctoral Program of the Faculty of Economics and Business, Gadjah Mada University held a public defense for I Made Bayu Dirgantara, a doctoral student in the management study program and a lecturer at Diponegoro University Semarang. Dr. 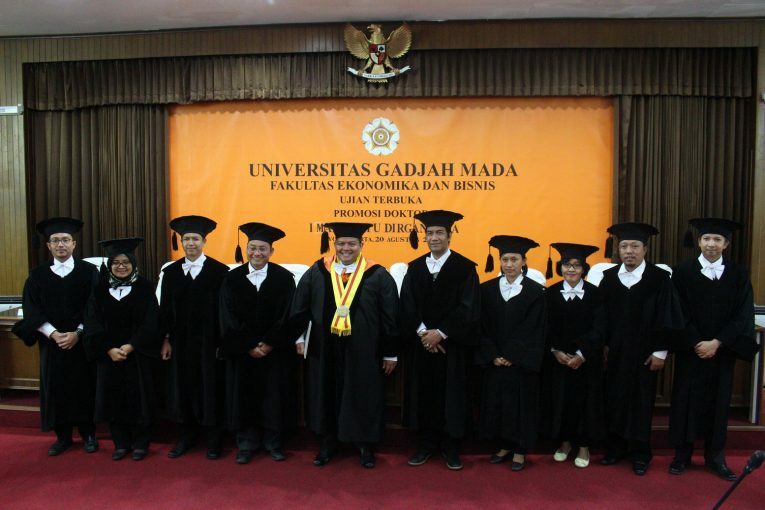 I Made Bayu Dirgantara officially holds the 4101st doctorate at Gadjah Mada University and the 255th doctorate at the Faculty of Economics and Business. Public defense was lead by Amirullah Setya Hardi, Cand, Oecon., Ph.D. as chairman committee, and attended by the promoter team, B.M. Purwanto, M.B.A., Ph.D as a promoter, Bayu Sutikno, M.SM., Ph.D and Sahid Susilo Nugroho, M.Sc, Ph.D. as co-promoters and other committee members, Bayu Aji Aritejo, M.M., M.Sc., Ph.D., Suci Paramitasari Syahlani, M.M, Ph.D., Anton Agus Setiawan, M.Sc., Ph.D., Nurul Indarti, Sivilokonom, Cand, Merc, Ph.D., Yulia Arisnani Widyaningsih, M.B.A., Ph.D. The dissertation completed by I Made Bayu Dirgantara entitled “Comparing the Power of Prediction between the Theory of Planned Behavior and the Social Cognition Theory of Individual Behavior in Sorting Household Waste – Membandingkan Kekuatan Prediksi antara Teori Perilaku Terencana dan Teori Kognisi Sosial terhadap Perilaku Individual Memilah Sampah Rumah Tangga (in Bahasa)”. The dissertation was passed with a satisfying predicate. The dissertation compared the predictive power of two behavioral change theories (i.e., the Planned Behavior Theory and the Social Cognition Theory) on the behavior of sorting household waste. This study aimed to build a framework for changing the behavior of environmental care. It was conducted by survey method and quantitative analysis. The population of this study was households in Semarang City and the analysis unit was an individual as a household member. The results of the study concluded that the Planned Behavior Theory and the Social Cognition Theory were able to predict the individual behavior of household waste sorting. However, the Planned Behavior Theory is more predictive than the Social Cognition Theory. The Planned Behavior Theory can predict significantly individual intentions to sort household waste through perceived behavioral controls.